Throughout my years of visiting schools, I received many requests for a “chapter” book from older elementary students. In response, I wrote The Adventures and Mis-Adventures of Cowgirl Peg, which is a short autobiography. At first it felt odd writing about myself. However, sharing some of my life adventures and the lessons learned became an enjoyable experience. As with all my previous books, this one delivers some great messages for readers through an interactive perspective. In addition, the story instills a curiosity about our country’s Western heritage. The cover artwork and inner sketches by Pat Wiles are amazing. Readers with a 4th grade reading level and higher will enjoy this book! 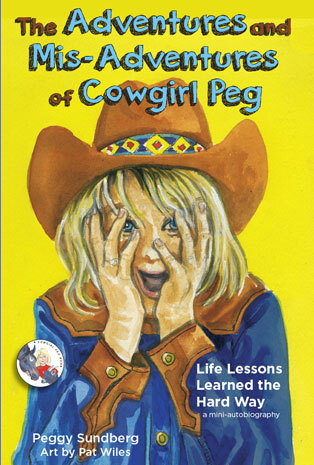 The Cowgirl Peg books have all been homeruns and Cowgirl Pegs “Adventures and Mis-Adventures” continues that record. My grandchildren absolutely loved them and we are now saving them for our great-grandchildren. Great job Cowgirl Peg, keep them coming!